Your Watchlist is a great place to track the movie and TV shows you want to watch. 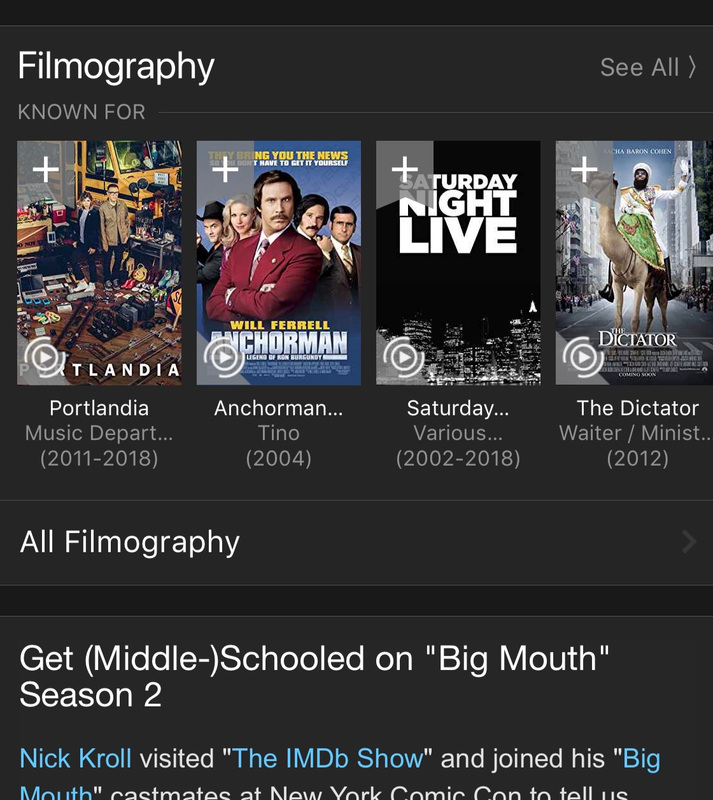 You can sort your Watchlist by the IMDb rating, popularity score and arrange your movies in the order you want to see them. You can also discover new movies using our growing collection of user authored lists and our powerful Advanced Search. IMDb Top Movies and IMDb Top TV are great lists to jumpstart your Watchlist. How can I add titles to my Watchlist? You can add titles to your Watchlist by selecting the "+" button on the title page. To add multiple titles from another user's List, select the compact view icon on the far right in the "View" field. 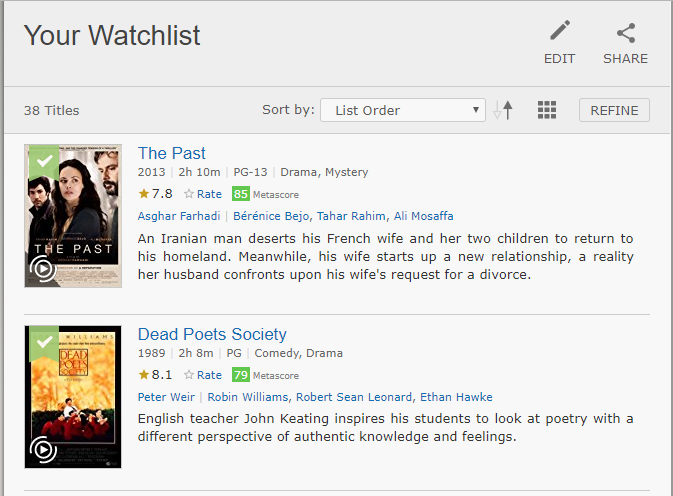 The compact view will enable you to select all or particular titles from the list to copy to your Watchlist. Once you've selected the titles, select "Copy from this list" from the pop up menu from the 3 vertical dots. 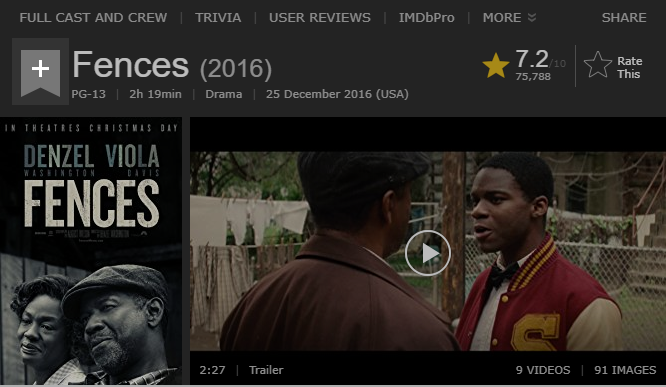 You can also add titles directly to your Watchlist from the Known For titles on each actor's page. This can be done using either the desktop or app version of IMDb. How do I remove a title from my Watchlist? You can remove an item from your Watchlist by clicking the green check mark on the title poster. Once removed the title will show with the gray "+" button. If you've changed your mind and want to re-add it, just click the "+" button again. 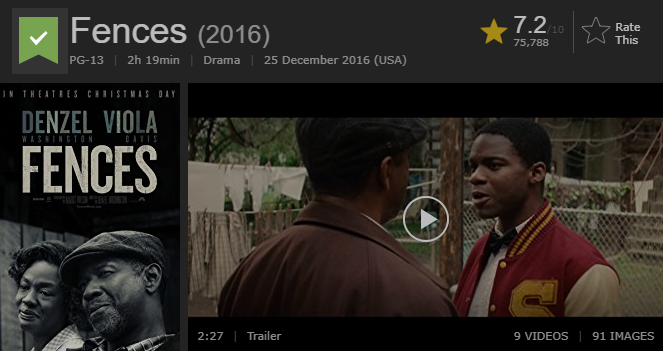 Before removing a title from your Watchlist, we recommend clicking the star to give the title a 1-10 star rating (worst - best). Rating a movie will save it to your Your Ratings and helps you recommend titles and start creating your lists on IMDb. Can I create a custom order for titles in my Watchlist? To change the order in which the TV shows and movies are displayed in your Watchlist, click on the edit list link at the top right hand corner of your list. Type in the number for where to order the title in your Watchlist and click "Save Reordered List" at the bottom of the page. How do I delete my Watchlist? Watchlists are automatically created with every IMDb account and can't be deleted. You can remove a title from your Watchlist, by clicking the green check mark. Can other people see my Watchlist? Your change will be automatically saved and your Watchlist can now be shared. How do I navigate to my Watchlist? 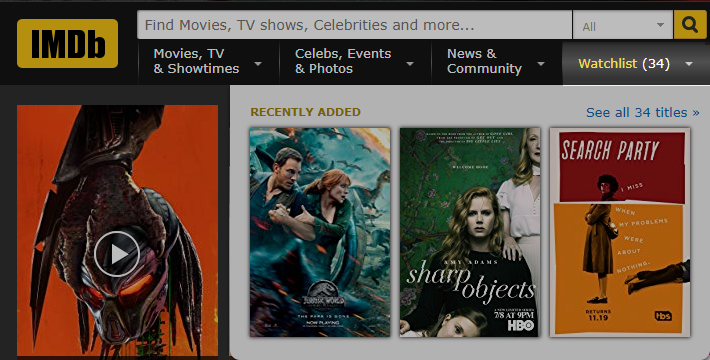 To navigate to your Watchlist, select "Watchlist" from the navigation bar while logged into your IMDb account. You can also easily navigate to your Watchlist on the "Your Activity" page.